Description: 14" which more than half is a very long and deeply-forked black and white tail. Adult has bright salmon-pink sides and belly, head, upper-back and breast pale grayish white. 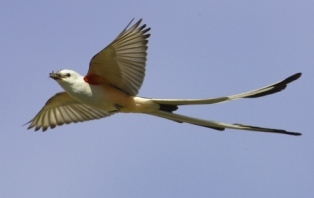 Immature scissor-tails have short tails and resemble western kingbirds; however, their underparts are pinkish rather than yellow. Habitat: Open and semi-open country, roadsides, chaparral, ranches. Often seen perched on utility wires or fences. Nesting: Produces 5 creamy brown-spotted eggs in a bulky stick nest lined with soft materials placed in a solitary, isolated tree. Diet: Almost entirely insects; few berries. 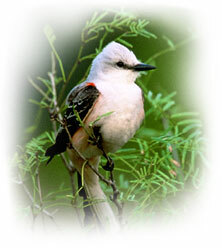 Feeds on insects, making it a valuable bird when it comes to controlling insect pests. Insects consumed include moths, butterflies, grasshoppers, locusts, beetles, and cotton worms. Notes: Spirited defender of territory against crows, hawks, etc. Gregarious in non-breeding season, Male performs acrobatic "sky dance" during courtship which even includes a few reverse summersaults in mid-air! Local Lore: When the Scissor Tails returns, it is a sign to plant tomatoes.